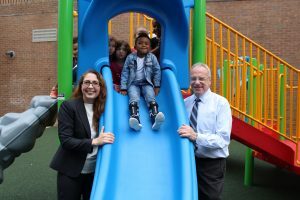 The Riverdale Y had a special day today, bringing Assemblyman Jeffrey Dinowitz and State Senator Jeffrey Klein to our facility to celebrate the completion of two projects to benefit the Riverdale Y and the community. Please drop by to see the playground and the pool. These are two of the many upgrades to the Y that we are planning. With continued help from our friends in the Assembly and the Senate, and with special donations from our community, we can make the Y even better than it is today. If you see Assemblyman Dinowitz or Senator Klein in town, please thank them for their generosity to our Y and to our Riverdale community.